The Health Ministry of Ukraine plans to introduce tools similar to reimbursement tools for providing patients with orphan diseases with medicines, Deputy Health Minister of Ukraine Roman Ilyk has said. "It is necessary to develop a register of ultra-orphan patients, whose treatment requires very expensive innovative drugs. These patients should be provided with medicines under other rules compared with other orphan patients. 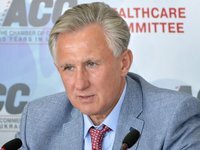 For other orphan diseases, in the future we plan to introduce reimbursement tools, but they will apply somewhat differently, than reimbursement in the Affordable Medicines program," he said in an interview with Interfax-Ukraine. According to Ilyk, "the negotiation procedures, meetings with manufacturers and special conditions, as it is done in other countries, should act to provide medicinal support to treat ultra-orphan diseases." He also said that currently the Health Ministry is developing the format of the negotiation procedure. "It will be a legal act regulating the procedure for holding a negotiation. In fact, we already have a draft of this document. It is quite real that we will approve it this fall," he said. Ilyk also said that the negotiation procedure will apply to other groups of diseases.